While the tech world is all set to see the advancements in 2018, Google on Monday released the Android platform distribution chart for the month of December to highlight where its mobile platform stands this year. Android Nougat has continued its upward trend and reached over 23 percent of active devices. Android Oreo, on the other hand, is now running on 0.5 percent of the total Android devices, a marginal increase from the previous month. 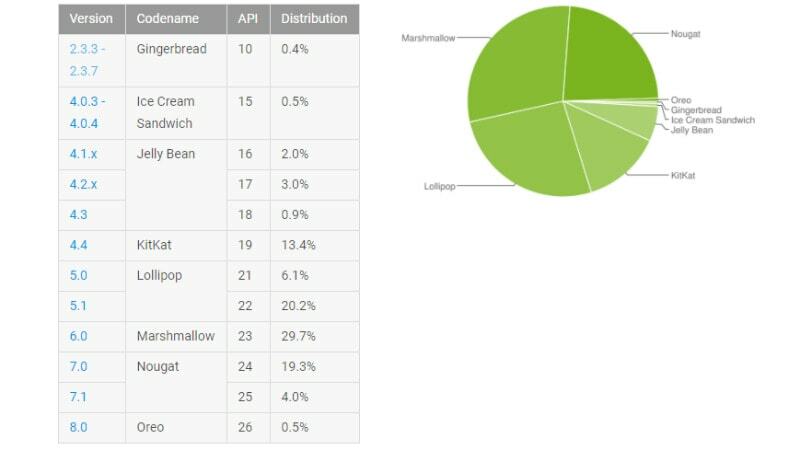 The install base of Android Oreo matches that of Ice Cream Sandwich, which was released in October 2011. Notably, the Oreo version grew 0.2 percentage points, from the 0.3 percent distribution share reported last month. This comes as a result of the latest update rollouts on devices such as Nokia 8, Sony Xperia XZ, and the HTC U11 Life, apart from sales of as the newest Pixel models. However, there is still a massive gap if we compare the distribution share of Android Oreo with Android Nougat i.e. 22.8 percentage points. Google is well aware of the sluggish growth of Android Oreo, and this is not the first time when the newest Android version has the lowest distribution share. Having said that, the Android maker is planning to improve the distribution by opting for initiatives such as Android Oreo (Go edition) and Project Treble. The Go edition is aimed at providing stock Android experience on affordable mobile devices, whereas the Project Treble development is designed to deliver faster updates by allowing OEMs to seed new improvements and tweaks without a lot of effort. In addition to Android Oreo, the Nougat version that comprises Android 7.0 and Android 7.1 builds reports growth with 23.3 percent of the share, compared to 20.6 percent in November. Companies like Samsung and Xiaomi, along others, are continuously bringing new Nougat devices. This appears to be the prime reason behind its growth. Other than Android Oreo and Nougat, all its other major flavours have declined. The distribution share of Android Marshmallow fell down to 29.7 percent from 30.9 percent in November, while Android Lollipop declined to 26.3 percent, compared to 27.2 percent. Android KitKat reduced to 13.4 percent from 13.8 percent last month, while Jelly Bean contracted to 5.9 percent from 6.2 percent.